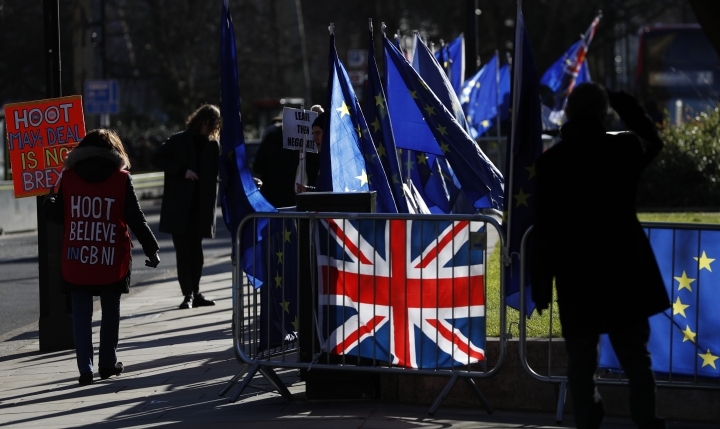 LONDON — A key member of Prime Minister Theresa May's government acknowledged Thursday that Britain's exit from the European Union may have to be delayed if negotiations on a divorce deal drag on. Foreign Secretary Jeremy Hunt told the BBC that while it is difficult to know whether negotiations will stretch to the final hours, a delay may be necessary to pass legislation to implement Brexit. His comments gained attention because of fears the country is simply not ready to leave — even though May's Downing Street office insisted nothing had changed. "I think it is true that if we ended up approving a deal in the days before 29 March then we might need some extra time to pass critical legislation, but if we are able to make progress sooner then that might not be necessary," Hunt said. The comments come as the influential think tank, the Institute for Government, warned the government was not ready should a no-deal Brexit come to pass. The think tank predicted that in a majority of broad policy areas, including health and borders, the government would be unable to avoid "major negative impacts." "It is not just the government that needs to be ready - business and citizens need to know how the changes will affect them and what they need to do," it said in a report. Britain's carmakers issued a stark assessment Thursday about Brexit's impact on the industry, warning that two-thirds of the country's global trade is at risk if the U.K. leaves the European Union without an agreement on the future. Investment in the industry fell 46 percent last year and new car production dropped 9.1 percent to 1.52 million vehicles in 2018, in part because of concerns over Brexit, the Society of Motor Manufacturing said. Chief executive Mike Hawes has described the threat of a no-deal as "catastrophic." "With fewer than 60 days before we leave the EU and the risk of crashing out without a deal looking increasingly real, UK Automotive is on red alert," Hawes said. "Brexit uncertainty has already done enormous damage to output, investment and jobs." Hawes said the figures showing a drop in investment, stark though they are, pale in comparison to what is ahead should the U.K. leave the EU on March 29 without a deal, severing frictionless trade links overnight with the EU and other global markets. Britain's Parliament has refused to rule out a no-deal Brexit, voting this week instead to give Prime Minister Theresa May more time to try to iron out a compromise with the EU. "Brexit is the clear and present danger and, with thousands of jobs on the line, we urge all parties to do whatever it takes to save us from 'no deal'," Hawes said. If no deal is in place, existing trade agreements with the EU will evaporate overnight. Without such agreements, economic chaos is likely to follow, with fears about trade in food, medicine and other essential supplies. In another sign of the ticking clock, House of Commons leader Andrea Leadsom said a scheduled February recess for lawmakers may be scrapped. May must report back to the House of Commons by Feb. 13, either with a reworked version of the deal or with a statement on what she plans to do next. She intends to return to Brussels in hopes of reopening negotiations on the most controversial aspect of the withdrawal deal, which covers the border between the U.K.'s Northern Ireland and EU member Ireland. This section of the deal, known as the backstop, would keep the U.K. in a customs union with the EU in order to remove the need for checks along the border. Supporters of a sharp exit with the EU fear it will trap Britain in regulatory lockstep with the trading bloc, and want the backstop replaced with unspecified "alternative arrangements." EU leaders have so far been unwilling to reconsider the withdrawal agreement. In a telephone call on Wednesday evening, Irish Prime Minister Leo Varadkar told May that it was necessary to have a backstop that was "legally robust and workable in practice." The border is crucial to the divorce deal because it will be the only land frontier between the U.K. and the EU after Brexit. Border checkpoints have disappeared since Ireland and Britain both became members of the EU single market in the 1990s, and since the 1998 Good Friday peace accord, which largely ended decades of violence in Northern Ireland. European Council President Donald Tusk also spoke with May and later tweeted: "The EU position is clear and consistent. The Withdrawal Agreement is not open for renegotiation."